Close X You have no items in your shopping bag. 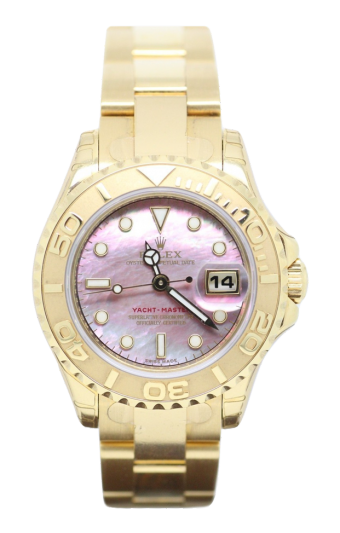 This stunning pre owned Ladies Rolex Yachtmaster with 29mm watch case and oyster bracelet are 18ct yellow gold whilst the dial is black mother of pearl. Cheshire Watch Company are supplying this watch complete with all boxes and Paperwork which is dated 2016 and the watch is still unworn and factory sealed. Our company's ethos is to offer fantastic discounts on all new & pre-owned luxury Swiss watches along with our vast range of Diamond jewellery. All of our advertised stock is in store for you to view whenever is most convenient, if you can not see the watch you are looking for just contact us and we will find it for you.Our buying team travel thousands of miles every month to ensure we have the latest most desirable stock in our store. Our business has grown with thousands of satisfied clients worldwide looked after by a hand picked team of buyers and salespeople.All of our team are passionate about making your dream purchase come true. Items are posted out for next day delivery by Royal Mail Special Delivery or Fedex with full insurance. We pride ourselves on good communication and if, for any reason, the delivery times exceed this, you will be notified immediately. Returns are accepted at the discretion of The Cheshire Watch Company Ltd,only if the item(s) that arrive are different to those described in the listing,or if the item is damaged in transit subject to a successful claim through the insurance process. We are to be contacted in the first instance via E-mail or telephone for authorisation of a return of a purchased item.Please check item fully before purchase.The buyer is understood to have fully read all listing details and asked all relevant questions, thank you. Items must be returned in the exact condition they were supplied all seals and accesories must be in place and untouched. Special order items are non refundable. Correctly supplied items agreed for return by The Cheshire Watch Company Ltd will be issued with a credit note,any alternative credit will carry a 25% restocking charge.